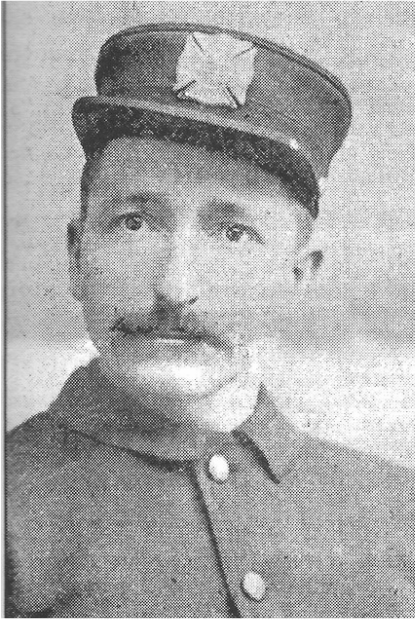 The scene has several errors: Chief Stagg was sick at home and was not directing the fire. 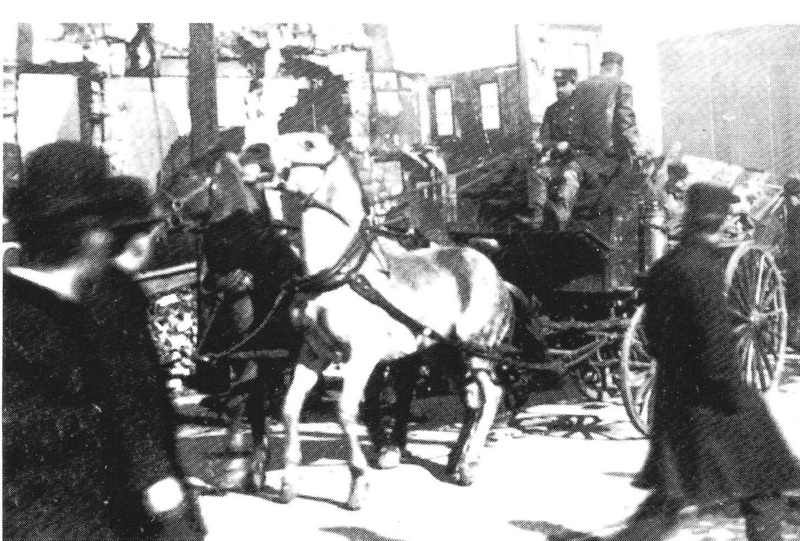 Horses were never kept so close to fire scenes - they were disconned and brought to safer locations. 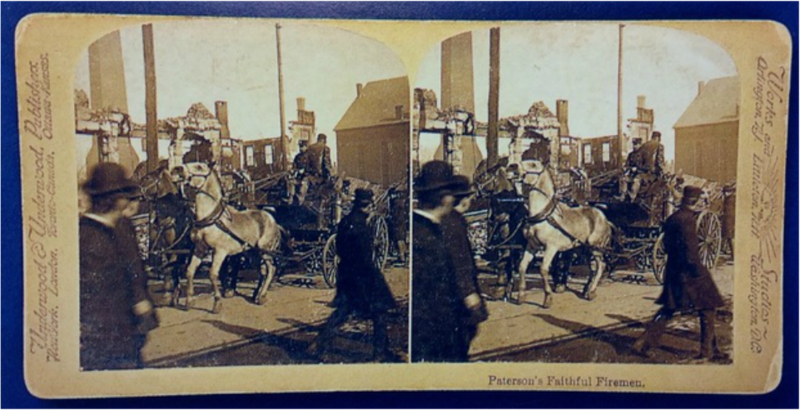 The steamers shown in the fire were of the type PFD bought after the fire, in 1902 they had much smaller, outdated steam fire engines. Unlikely they raised a ladder to such am engulfed building. 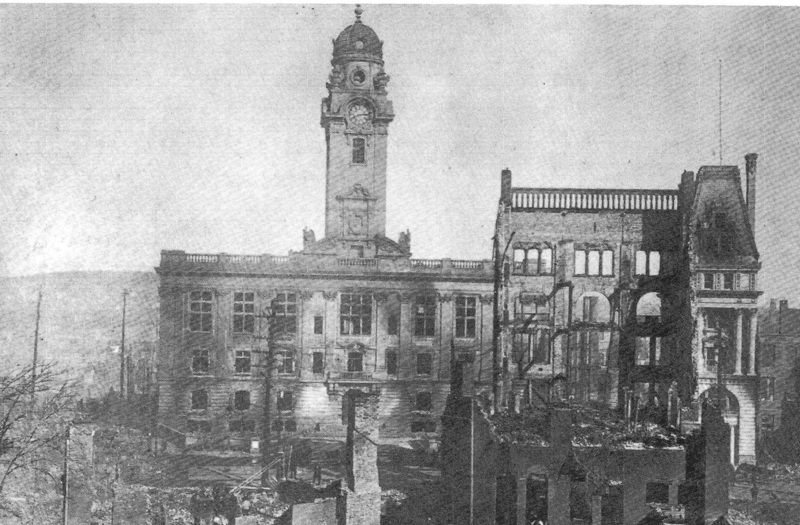 The most complete treatise related to the 1902 conflagration, the largest in Paterson's (and the state of New Jersey) history please see Glen Corbett's book pictured at right. 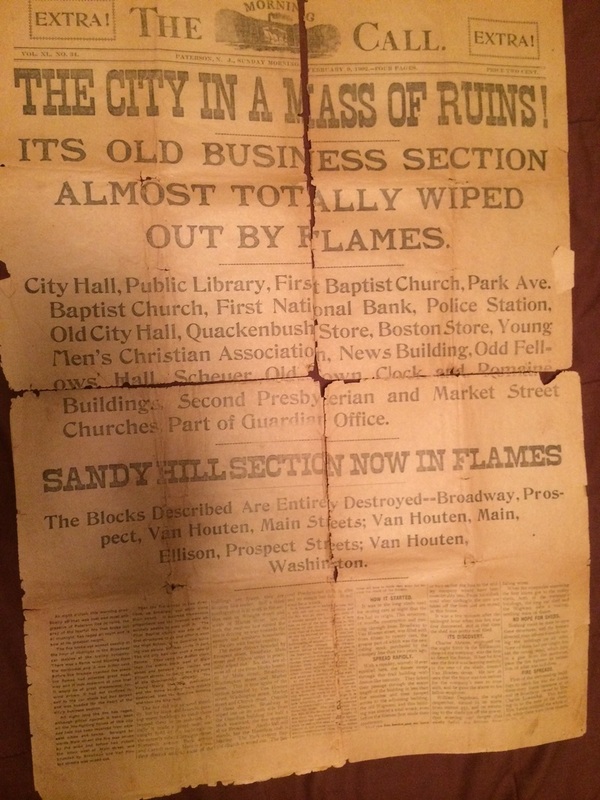 It is available at the Passaic County Historical Society. 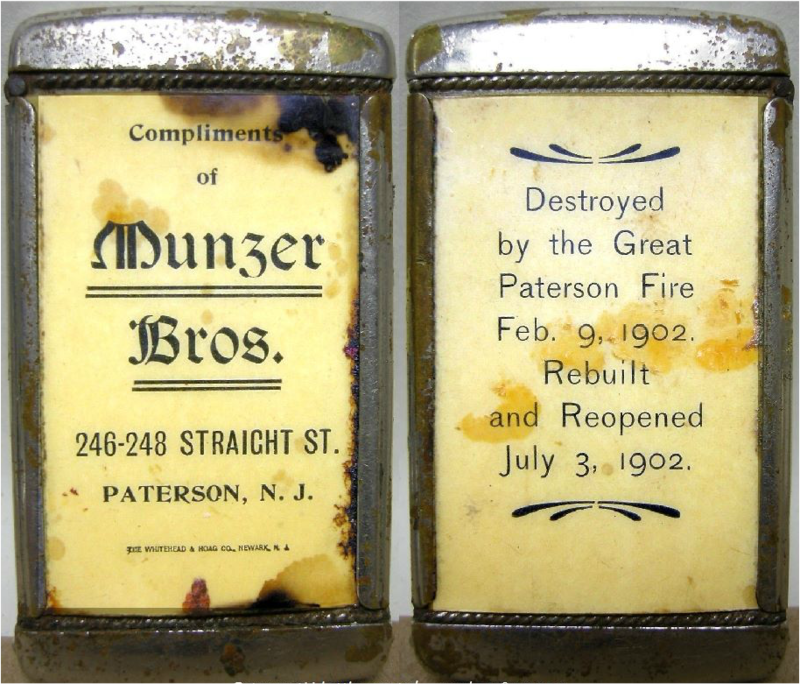 The fire started just before midnight on February 8 in the trolley car sheds of the Jersey City, Hoboken and Paterson Railway Company, located on Broadway, at the head of Mulberry street. 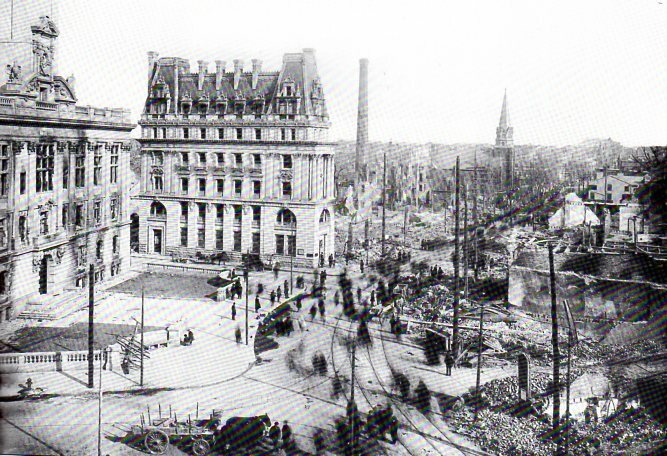 The immense building took up an entire city block. The first alarm was sounded by an employee who ran to the fire box at Main Street and Broadway (Station 451) at 12:10 AM on Sunday the 9th. 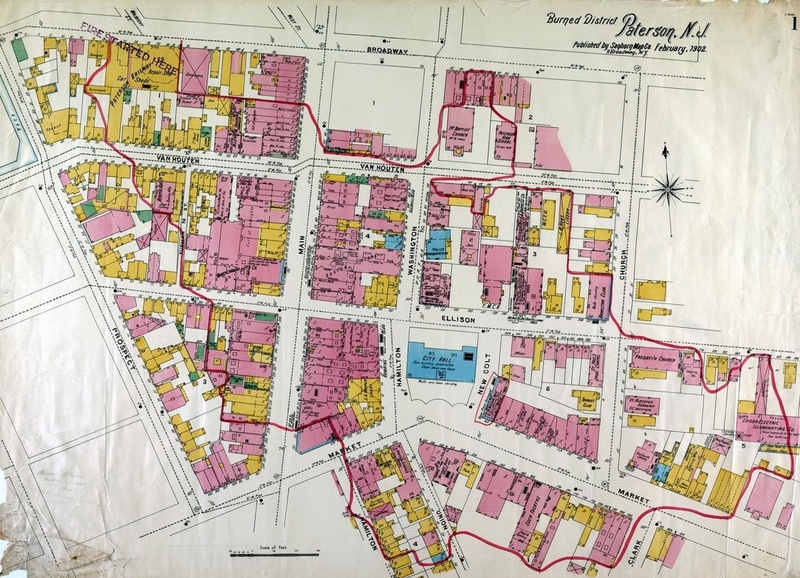 From the starting point, the fire burned in a southeasterly direction, destroying the blocks on the westerly side of Main street, from a point near Broadway, to within three doors of Market street. 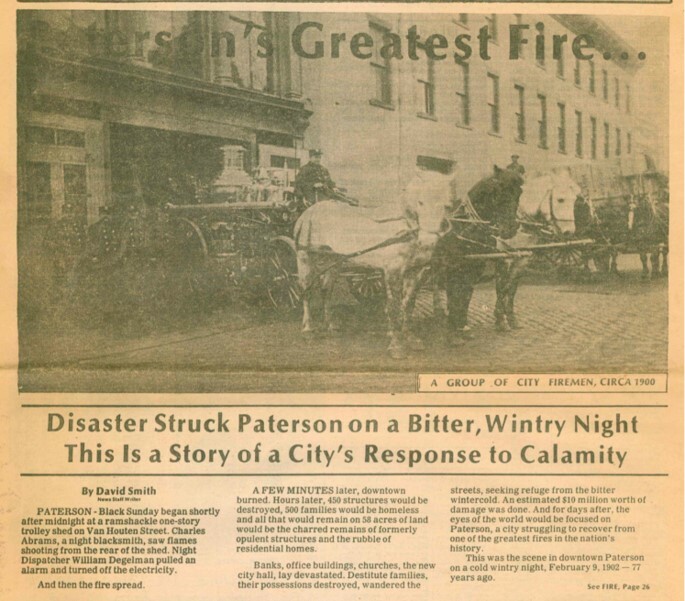 On the easterly side of Main street the flames wiped out the two blocks from Van Houten street to the Paterson Savings Institution, at the corner of Main and Market streets. 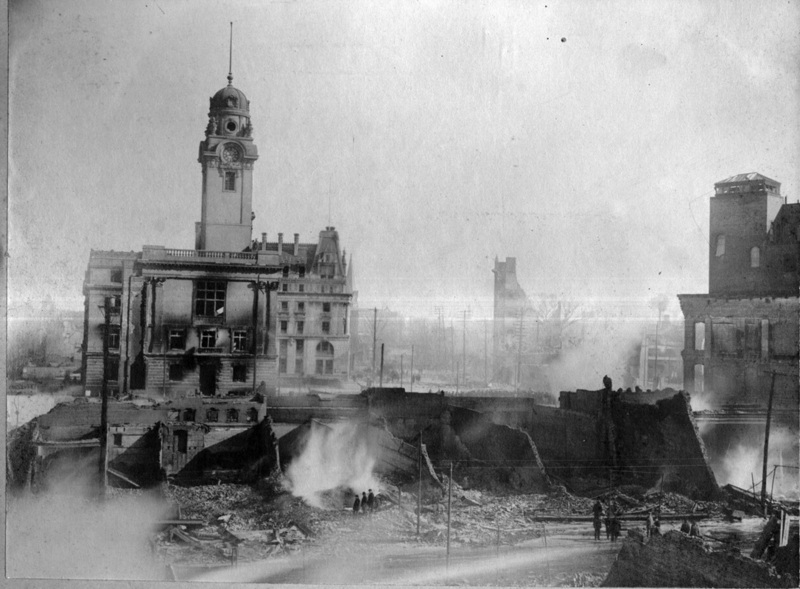 The flames also destroyed buildings on the southerly side of Market street from Hamilton street to Clark street, and the westerly half of the block bounded by Market, Church and Ellison street. 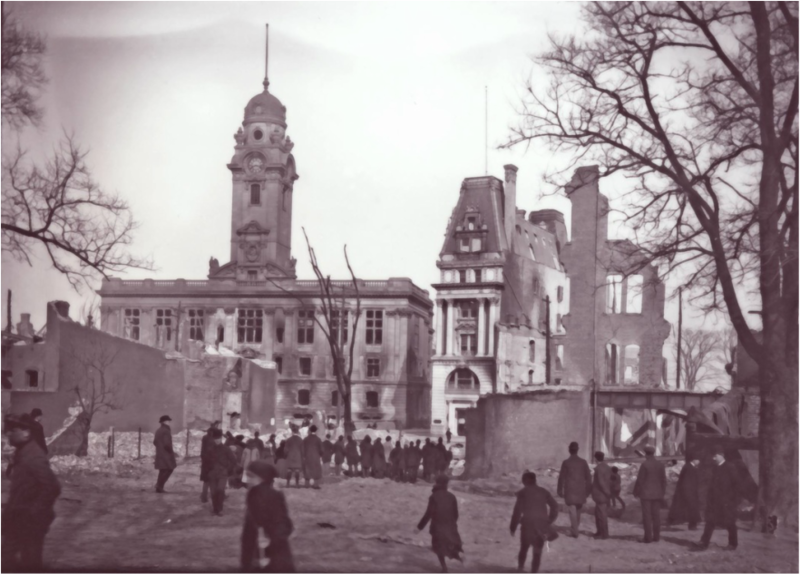 ​From this point the flying embers fired the buildings east of the Erie Railroad and destroyed property on the northerly side of Park avenue and between Park avenue to the southerly side of Market street as far as Carroll street. 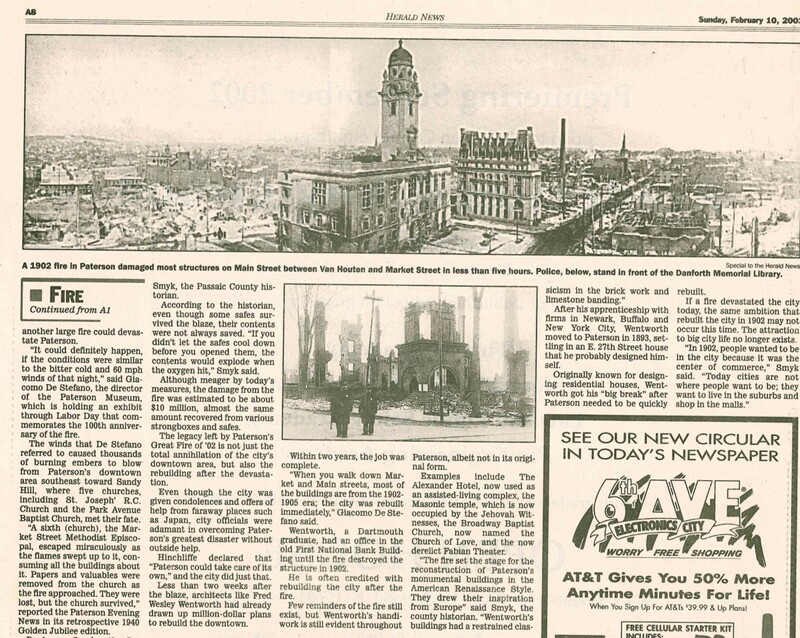 It was the biggest conflagration in the history of the city, and takes rank with the largest in the United States. 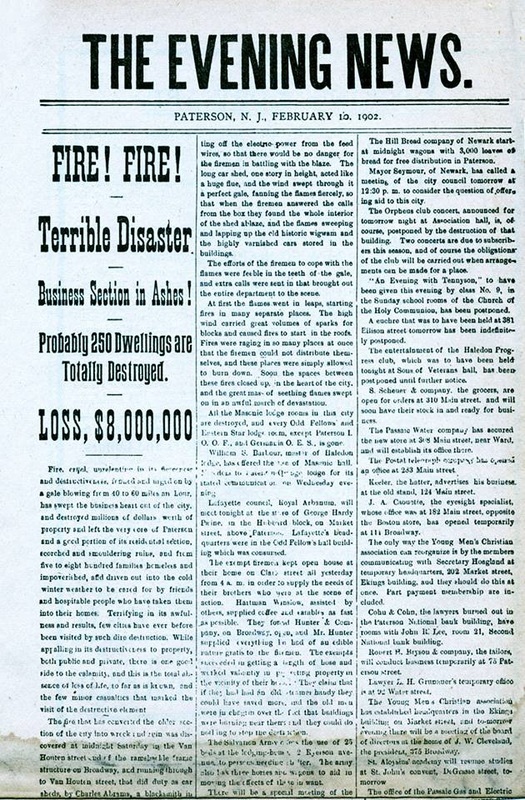 The fire burned from midnight Saturday until 1 o'clock the following day, at which time the danger of a further spread of the flames was considered over. 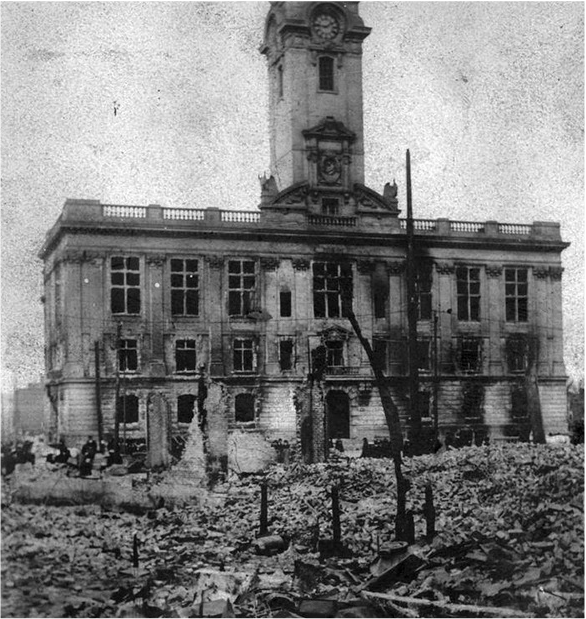 ​Not counting sheds or outbuildings, 459 buildings were destroyed, among them large business houses, banks, City Hall, five churches and the Free Public Library, with its 37,000 volumes. 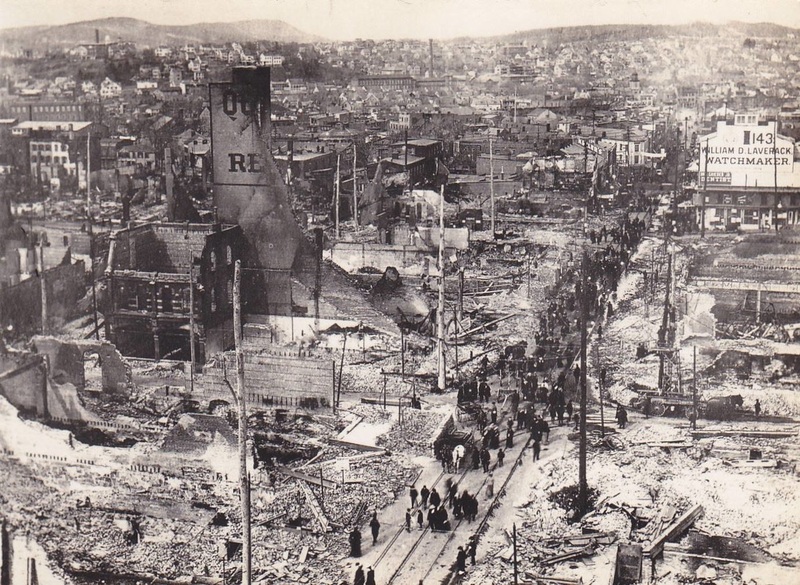 The insurance loss was approximated at $8,800,000, and the property loss at $6,000,000. 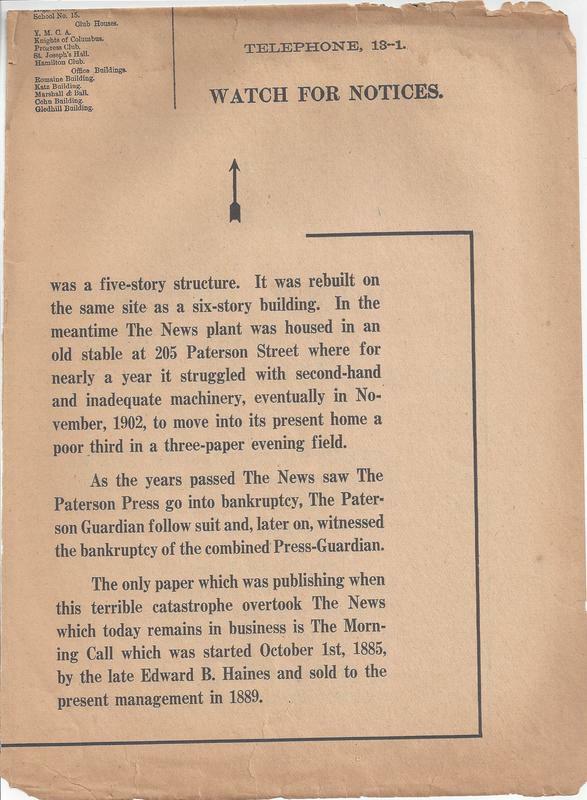 Five hundred families lost their homes and everything they owned. 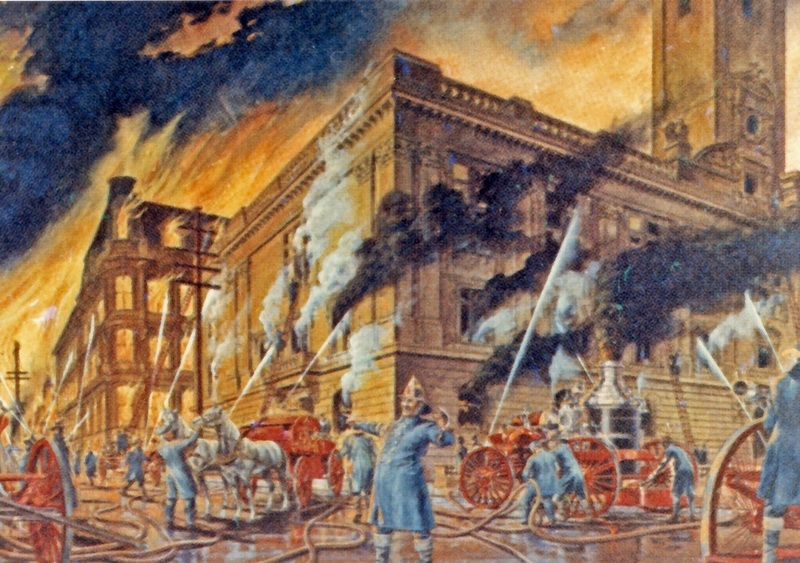 Fireman John McMullen (at right) of Engine Company 5 was injured during the collapse of Continental Hall. The following text comes from an article by Todd Hollritt of the 1st Responder News. 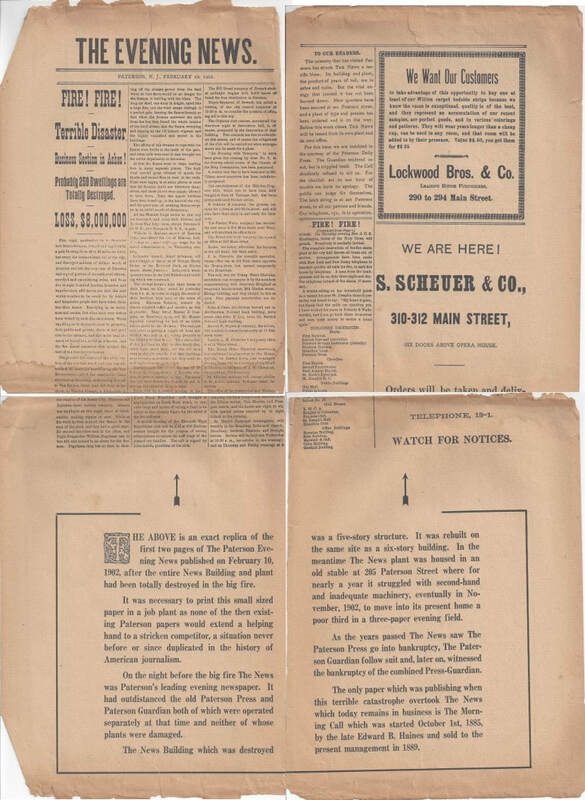 It reports on what was written in the Company Logbook by Captain B. Wilson. Although this report was presumed to be from an Engine Company it is very likely that it is from Truck Company 1 on Jackson Street: note Engine companies with hose wagons had more than 5 men in 1902, the only apparatus in 1902 carrying a 55 foot ladder was Truck 1 and one of the photos above show Truck 1 at the Hamilton Club, which is also mentioned in the log. 12:13 am Received a Third Alarm from Station 451. 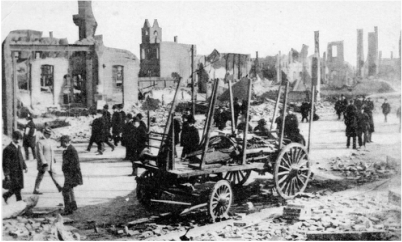 Apparatus left quarters with officer and 5 men. Fireman Norris being on sick list. Reported to Chief Mills at the car sheds (Origin of the fire) on Broadway and by him ordered to assist the department to get to work. 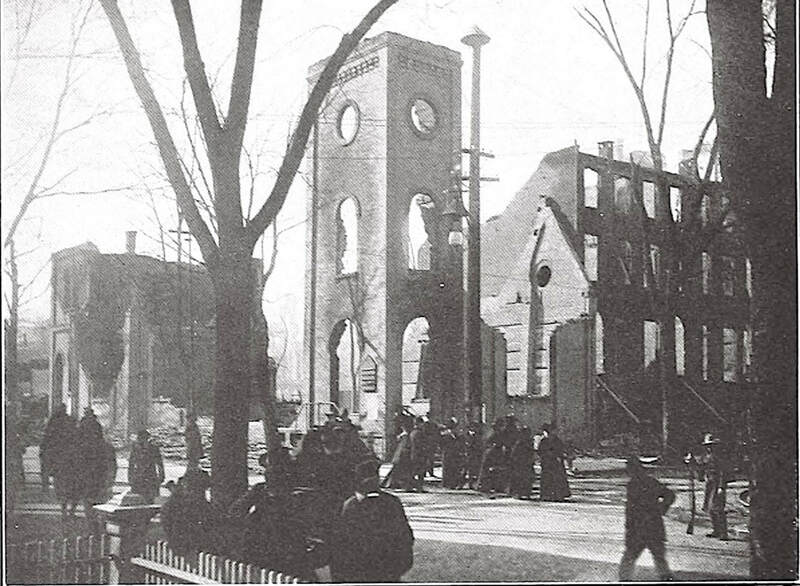 Stretched in our chemical line to the rear of Cleveland, Stinsons and O’Neil’s stores finding that packing boxes and barrels had caught fire from sparks, while working at this fireground was ordered by Chief Gillmore to proceed at once to the First Baptist Church it having caught fire in the steeple. Assisted Engine 7 (responded on the General Alarm) to get to work at this location, and then the Passaic Engine (Mutual Aide) came on the ground. Helped them to line in between School house and (Affiolic?) hall to rear of Guardian building. Raised a 35’ and a 30 ft ladder on the hall. 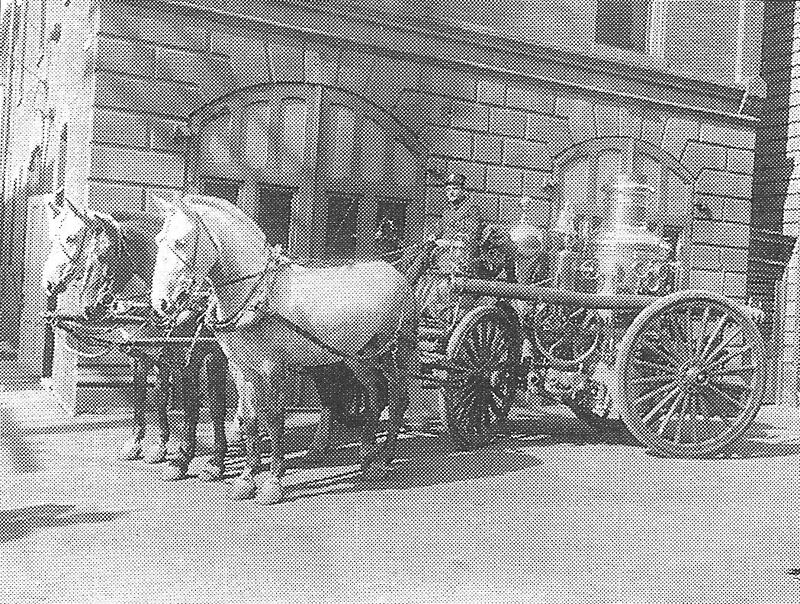 We then manned a pipe from the Passaic Co. and worked on the Patrol Stable and changed the position of Engine 3 in the old City Hall. 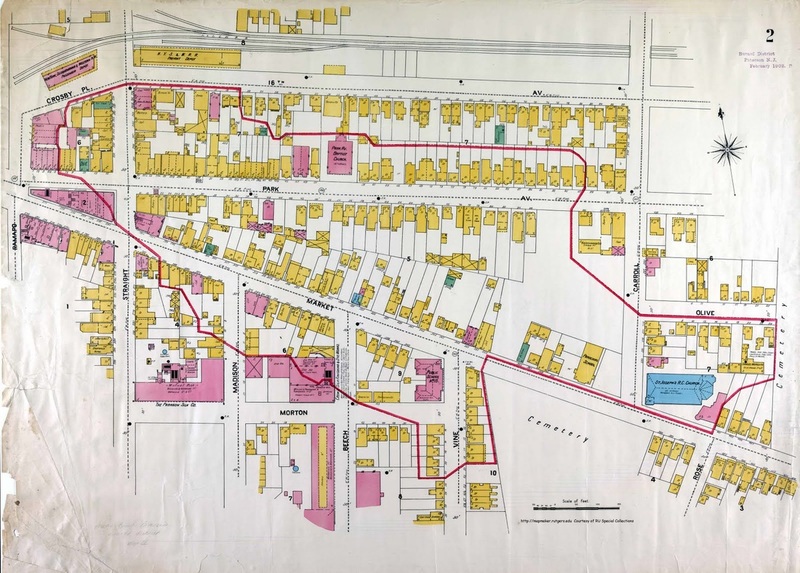 Then back to the Van Houten Street stables and changed the Passaic steamers line to the rear of the houses on Church St.
Was then ordered to the Hamilton Club raised a 55 Ft ladder. Assisted Engine 7 to the roof. 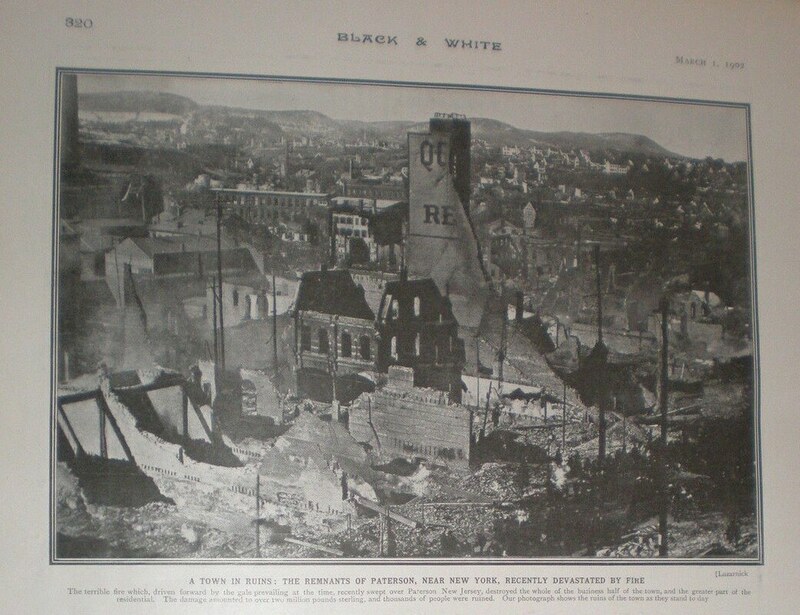 But was forced back by fire. 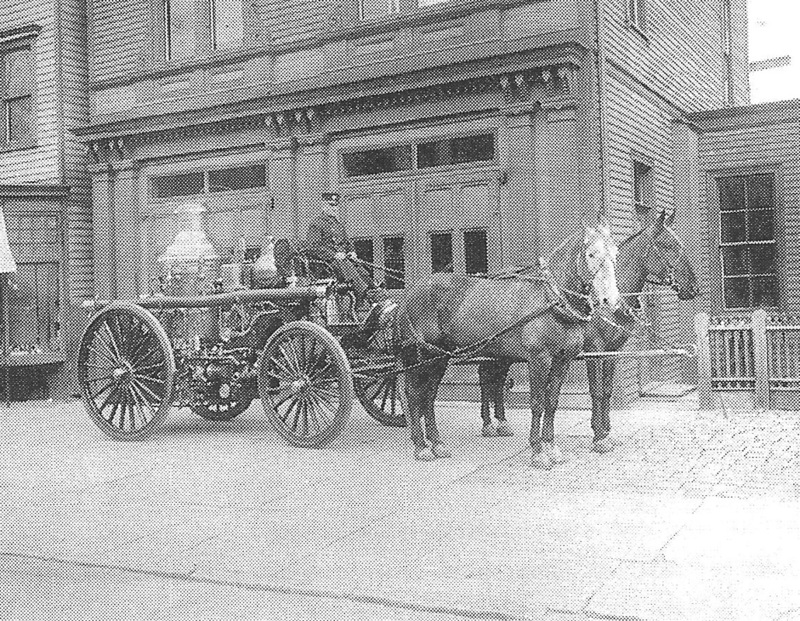 Was ordered by Chief Gillmore to go to Market Street and bring the Jersey City Engine (Mutual Aide) down to the corner of Church and Ellison Street where we assisted them to get to work on the Club house. While we were working our 55 ft ladder was broken. We worked at this fire until 9:30pm when we were ordered up by Chief Mills. 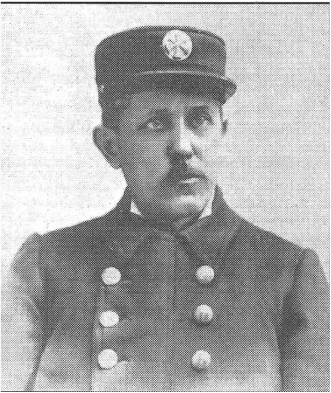 About 6:00 pm FF Kraus had to give up, his leg and foot paining him so he could not stand. And at 9 PM FF Farrel gave out having been taken with a severe chill. Engine Company’s time 22 hours 30 mins. Truck time 22 hours 15 mins. 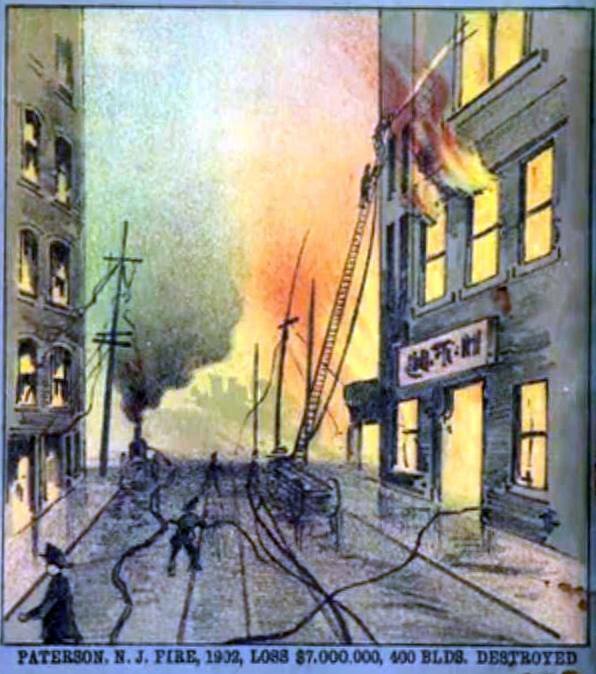 9:45pm To Quarters where we find we have lost one 30 Ft ladder two axes and two hooks. And find the 20 Ft extension ladder broke. Also one 3 gallon extinguisher lost. 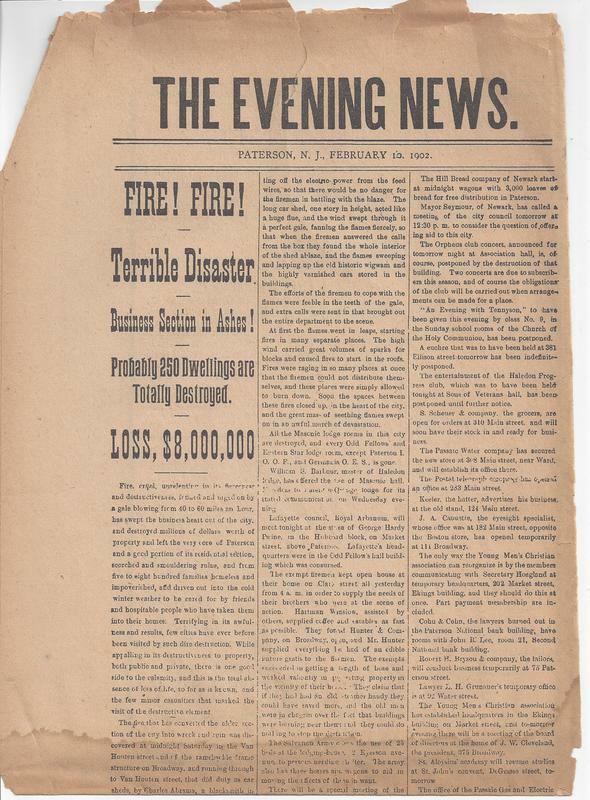 10:00pm Fireman Farrell left quarters on sick report. 11:55pm Received an alarm by telephone from Headquarters to go to 290 Straight Street. 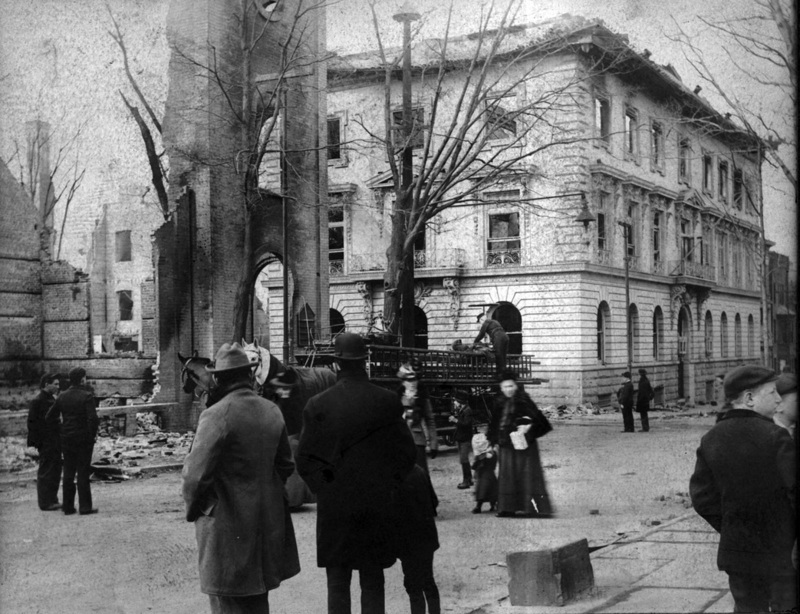 Apparatus left quarters with officer and 3 men. On our arrival there we found our services were not required. Firemen: Breen, Devive, Absent Norris, Kraus, Farrell all on sick report. 12:20am To Quarters Co. time 25 mins. 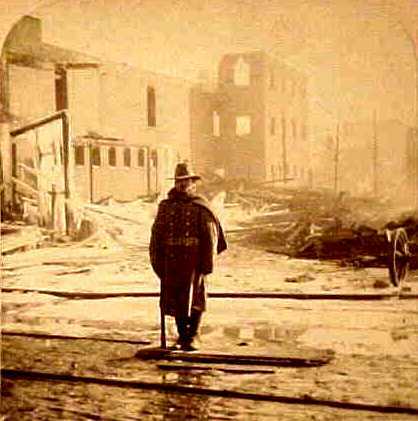 9:00am Captain left Quarters to report to Chief Mills the condition of the Company. 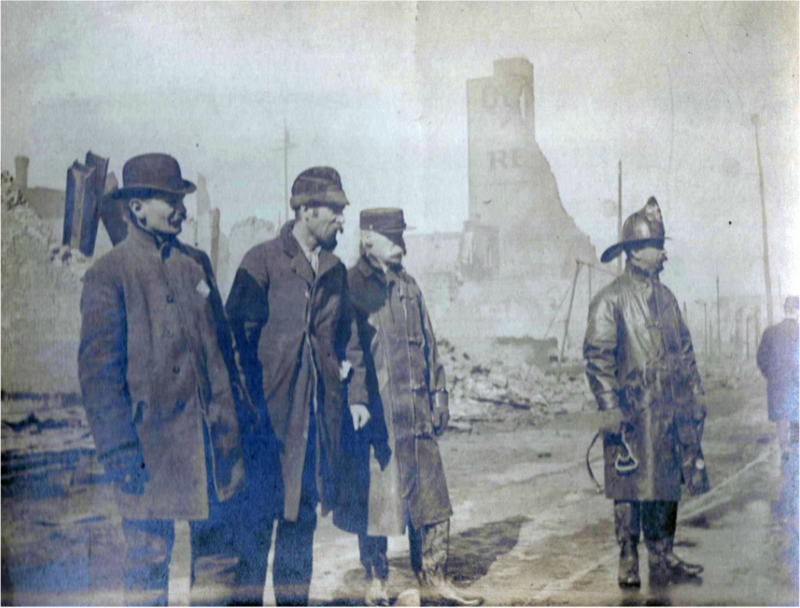 In the first report following the big fire, Chief Stagg reported that the discipline had not been up to the usual standard and that charges against members had been more frequently made. 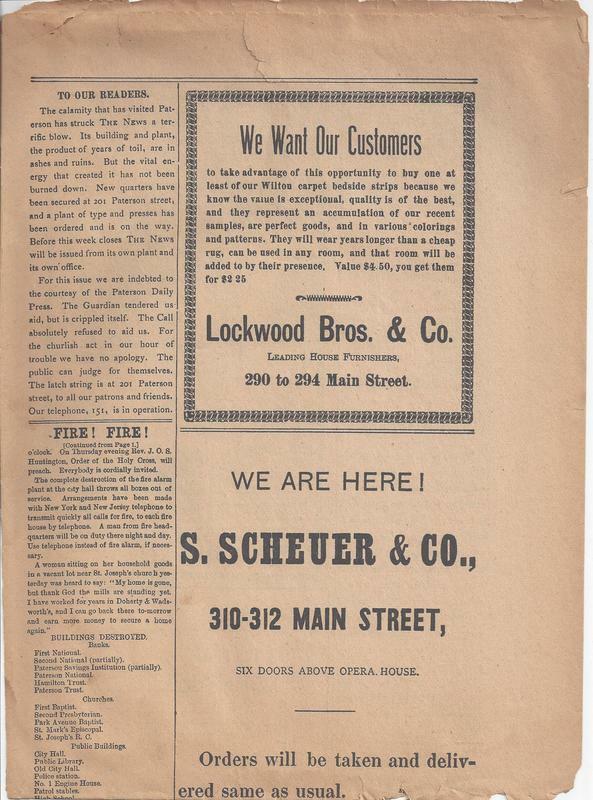 Attention was again called to the urgent need of new apparatus to replace the old stock and to the need of at least two new engines, two hose wagons, one truck and one officers wagon in reserve at all times. 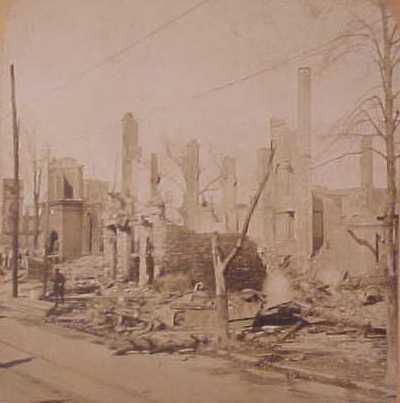 The engines in service would not be capable of giving a good fire stream on the new and larger buildings to be erected over the fire ruins. 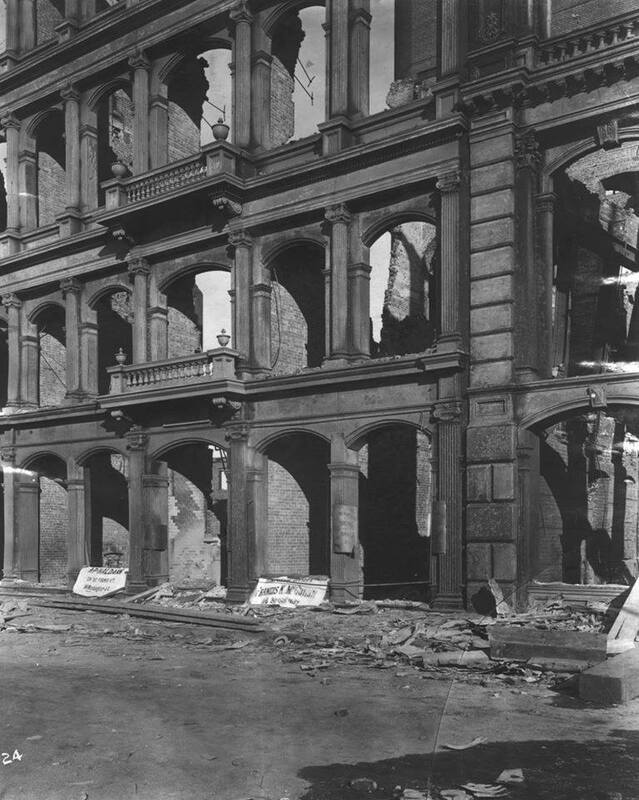 He noted 26 blocks were destroyed or damaged. 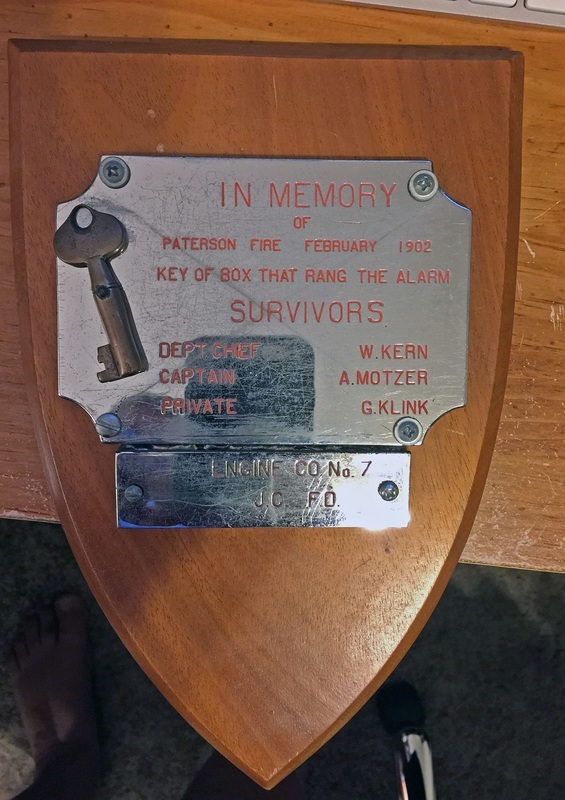 Engine 7 on the day of the fire or did Paterson send box keys as a memento to every town that provided mutual aide? 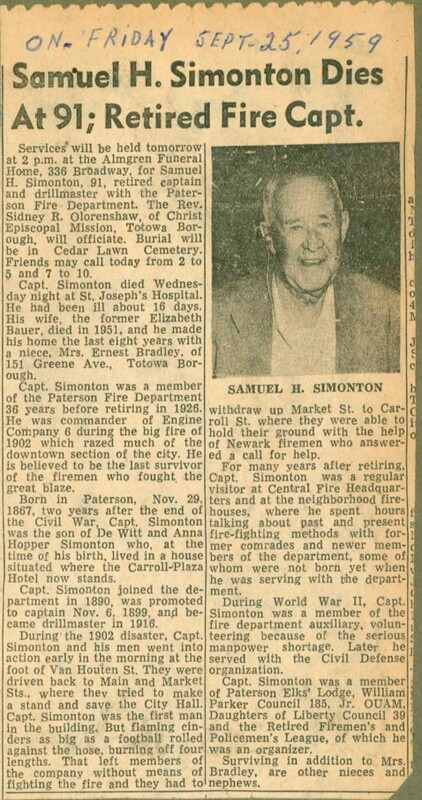 In Corbett's book he mentions that Chief Stagg did send out letters of thanks to various mutual aide cities. 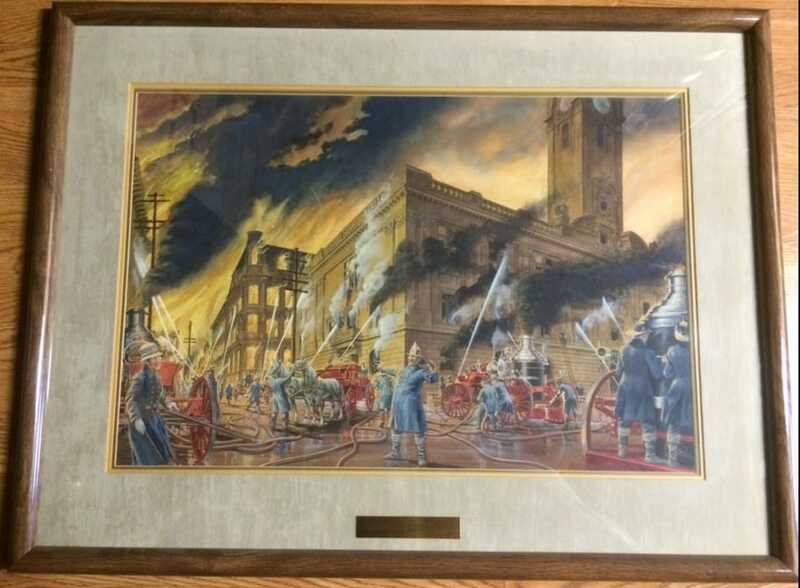 I suspect when this plaque was eventually put together the three men cited were the remaining "still alive" members of the JCFD Engine 7. Just another confusing undocumented firematic collectible we likely will never have the true story of.. 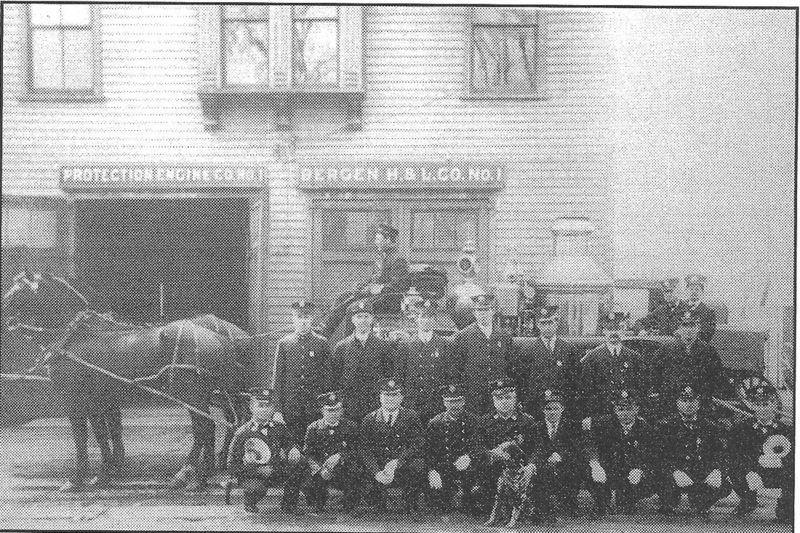 Note: regarding the above photo: It is labeled as "a group of city fireman circa 1900" but is actually a picture of the men and steamer (with the hose wagon in background) of Engine One at the newly rebuilt 112 Van Houten Street Firehouse. 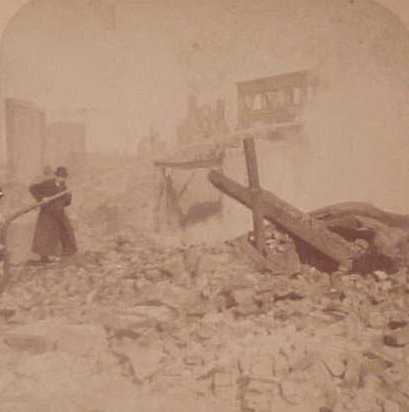 - the view is looking west on Van Houten Street towards Washington Street. 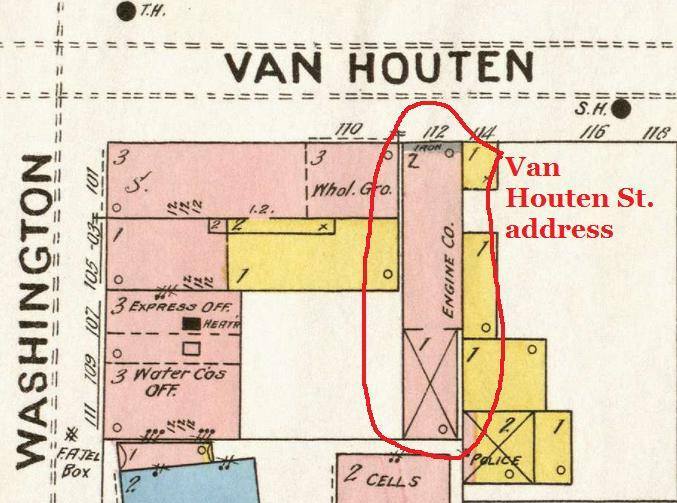 Interestingly 112 van Houten Street was the only FH that was significantly damaged in the 1902 fire (again not mentioned in story). Engine company 1 had to relocate to the Prospect Street FH until the FH was rebuilt afterwards. 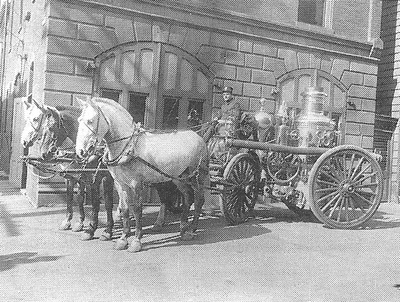 Another error is the photo shows a big First Size Metropolitan Steamer which was obtained in 1903 a year after the great fire: prior to and during the big fire Engine 1 had a very out of date smaller (second size) 1886 Button steamer. 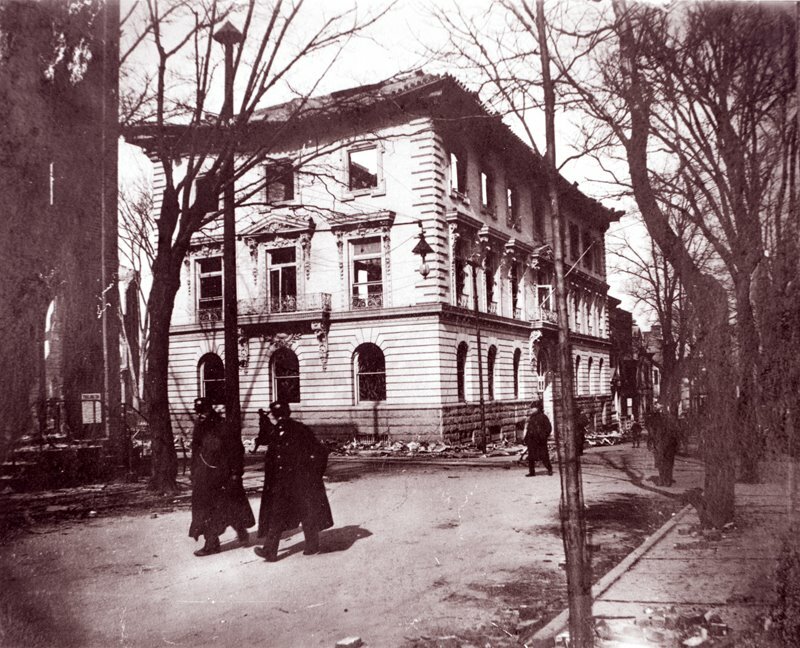 The above photo could be anytime between 1903 and 1912 but certainly not 1900. 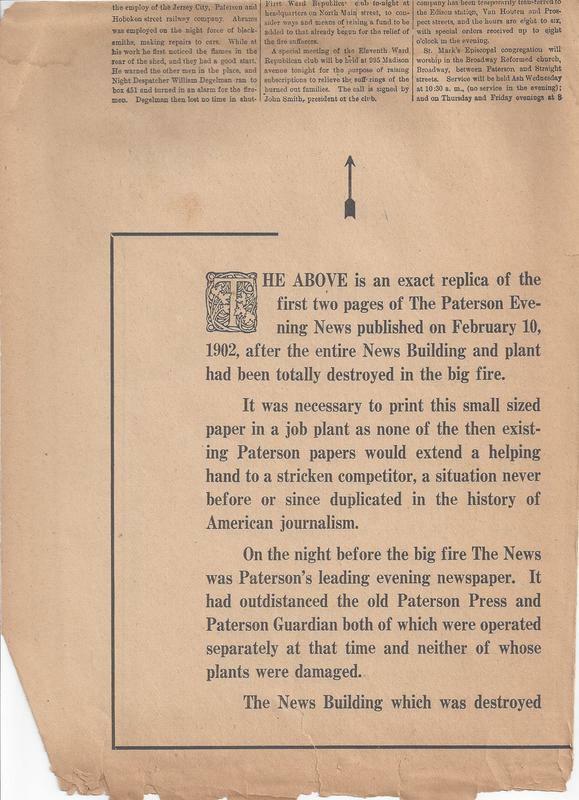 1940: For its Golden Jubilee the Paterson Evening News printed an exact replica issue by day after the fire (February 10, 1902).